The day started at 6am for me as I used the beautiful scenery of the Danube for my firs run of he trip. I ran 1.5 miles southeast until the trail stooped and then I returned and ran a little bit pat the hotel before finishing uphill to the hotel. 4.4 miles and a great way to start the day. We had a nice breakfast at te hotel and then set out for our next destination. 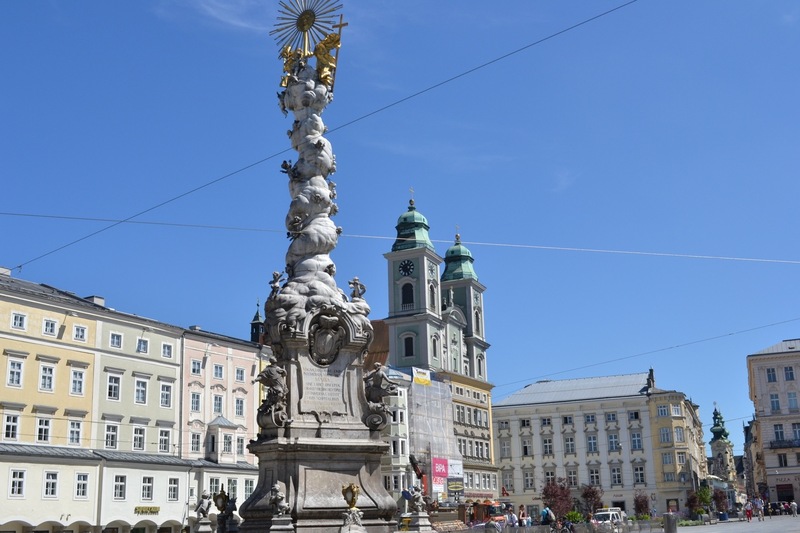 Our hotel is in Bad Ischl, but we decided to head do he biggest city along he way, which was Linz. We needed a big city because today is laundry day. We travel just with weekend suitcases to keep things light. But that means we need a laundry stop along the way. We were looking for a self-serve laundromat. The tourist information office in Linz pointed us to a closely laundry. We weren’t able to do our own, but were able to drop it off and pick it up folded and ready in 2 hours. We walked through the town square and into the main church. We had lunch at a Japanese restaurant, and then with dumb luck just happened to stumble on a Thomas Sabo store. How lucky can you get?! 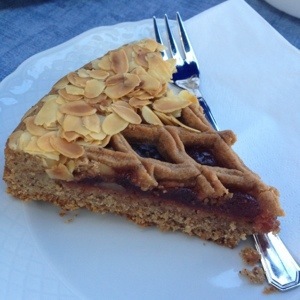 We saw signs that the Linzer torte hails from Linz so I had to try it. Got mine without ice cream, which was a mistake since the dessert is a little dry. But it was good. We picked up our laundry and headed out of town. It was about a 90 minute drive to Bad Ischl. Much of the drive reminded us of Norway last year, pretty scenery, driving through mountain tunnels. We came over one hill to a breathtaking lake surrounded by mountains. There were so many sailboats on the lake. Unfortunately, there was no overlook to pull off to in order to take pictures. We arrived in Bad Ischl around 4:30. The hotel had a spa, so we took a sauna, an ice shower (well, I did) and sat in the pool and sun. I know, quite unlike us to actually relax during a vacation. We walked a little through town before finding a restaurant, Weinhaus Attwenger, recommended by Frommer’s. We both had veal schnitzel, which was quite tasty. We took an after dinner stroll through own before calling it a night. Because I know everyone is as obsessed as I about getting my phone to work on Orange’s data network, I exchanged some messages with Verizon on Twitter today where they continued to blame everyone else. Orange had opened a trouble ticket from my visit yesterday and called and left a message. I was able to figure out thevoice mail system on my phone and retrieve the 3 minute message. Unfortunately, it was all in German. Tomorrow, we are off to Salzburg. Technical note: No free wifi at this hotel, so tonight’s blog uploaded courtesy of Ellen’s iPhone personal hotspot. 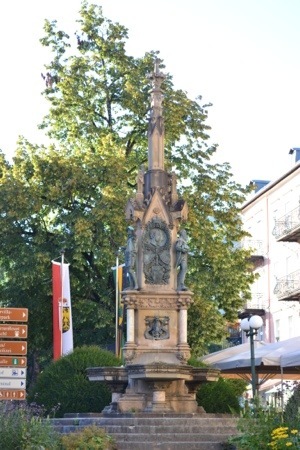 This entry was posted on Wednesday, August 1st, 2012 at 2:31 pm	and tagged with Vacation and posted in Bad Ischl, Linz. You can follow any responses to this entry through the RSS 2.0 feed. if only you had consulted Joan Brady re: laundry facilities. You DO recall that she is all-knowing, where doing laundry on the road is concerned, don’t you? !